I began a 2015 visit by travelling by train from northeast England. At Glasgow the rounded uplands of southwest Scotland gave way to rugged mountains, lochs, forests and grand Atlantic coast seascapes. 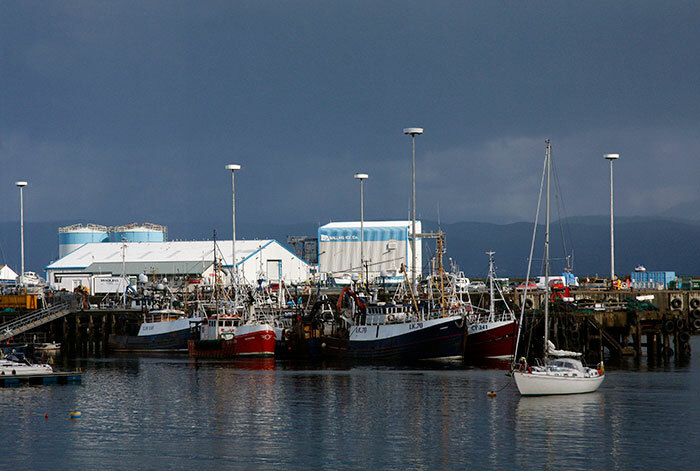 Mallaig developed as a fishing port from the mid-19C. Completed in 1901, the West Highland Railway from Fort William to Mallaig was a major engineering achievement and is rated one of the visually finest rail journeys anywhere in the world. The twenty-one arched concrete curve of the Glenfinnan Viaduct at the head of Loch Shiel is its structural masterpiece. Following a tea time arrival in Mallaig I had just twenty four hours before entraining for Oban and the Barra ferry. Late evening light until after ten o’clock and an early start before breakfast next day allowed useful time for photography. 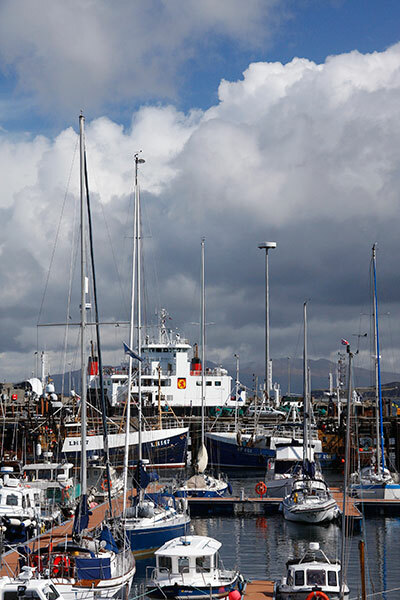 Most of the images concentrated on ships and boats in the harbour with some more to record distant landscape views westwards to Skye and other islands. 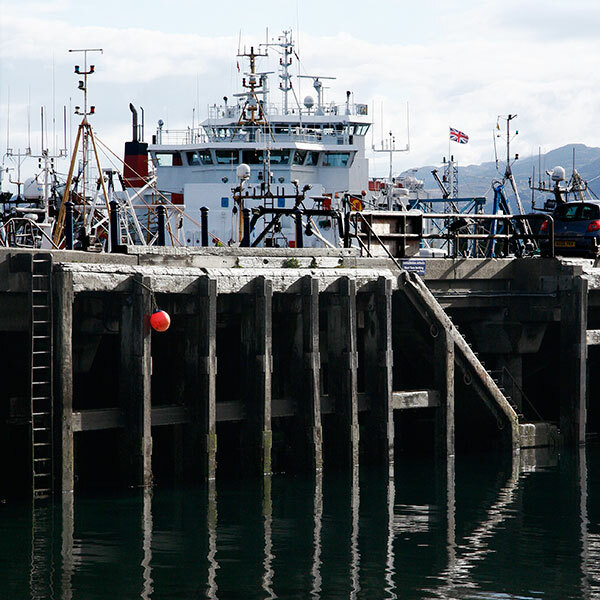 The SHIPS AT MALLAIG AND OBAN gallery shows black and white photographs of Caledonian MacBrayne ferries at the two ports. After overnight rain cleared I walked around part of the harbour before breakfast. A large spread of granite boulders presumably acts as a defence against rough seas penetrating the more open eastern end of the bay containing town and harbour. The metal structure linked the shore and floating pontoons in the small boat marina. The westward skies soon changed to the dark tones of Images 01, 02 and 04. Three piers in an E formation face east across a narrow bay with its shoreline backed by the wild and steeply rising landscape glimpsed in Image 09. The outer north wall was protected from heavy seas by huge granite boulders. From there one could see the southern Skye and the Small Isles of Eigg, Muck, Rum and Canna to the southwest. In the distant south lie Ardnamurchan Point and the islands of Coll and Tiree. The narrow shipping exit crossed the ends of the piers close to viewing points. I kept returning to this combination of a new building under construction and the two fishing boats under overhaul. I liked the background of grey slate roof and tall chimney pots. The usual interest in juggling with the arrangement of elements in the composition prompted adjustments of viewpoint as did the changing light across the day. Others were made from the East Bay road around the harbour and more from the shipyard entrance. I’m much more comfortable with this kind of subject than I am with landscape. 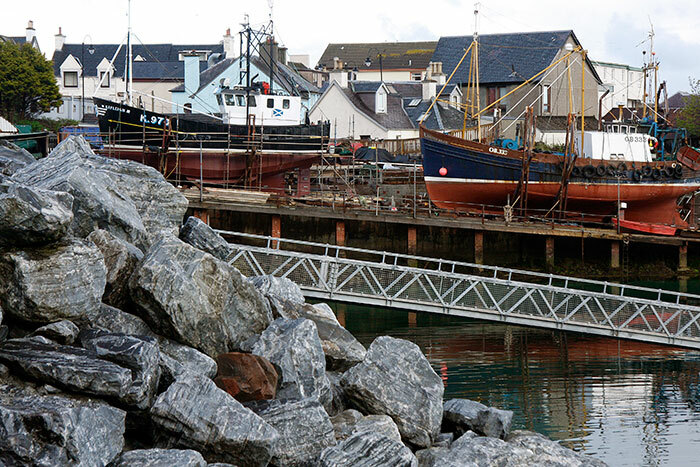 I made several images similar to this one, some including a little of the background structures behind the slipway. 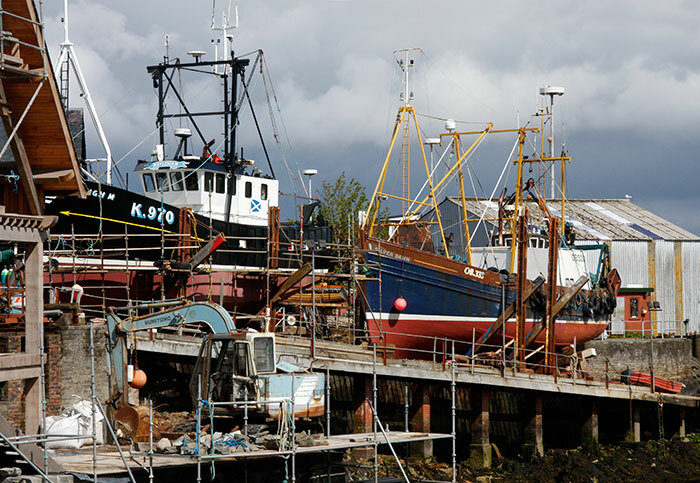 I prefer this one concentrating on stern and bow fragments from the two fishing boats framing a small wooden clinker-built boat, shipyard equipment and a strip of rust-mottled corrugated iron roof cladding. The tunnel perspective and sense of balance appealed, as did the contrast of all of that against the stark simplicity of the angled concrete way underpinning the composition. Photography from the entrance was acceptable to those working in the yard but understandably I had to stay outside. This bow shot includes one of the wheeled cradles and the chains used to haul it out of the water on slipway rails. The new pristine paintwork highlights the welded steel construction and the traditional 3D lettering. 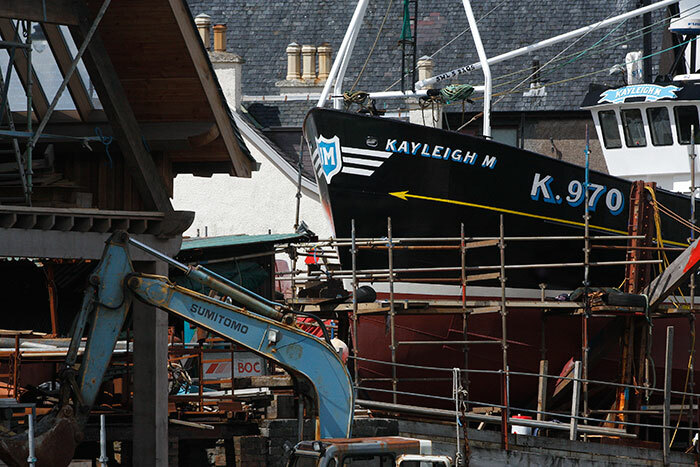 Kayleigh M was built at Stromness in the Orkney Islands and registered in nearby Kirkwall as K970. The wooden Silver Dawn hull is built to a carvel design with a long history, particularly on the east coast of England and Scotland. As a schoolboy I recall watching activity in a small shipyard in Northumberland as boats virtually identical to this one were built. The basic timber came in at the landward end and the formed and finished hull slid down the ways at the other: the yard closed a long time ago. 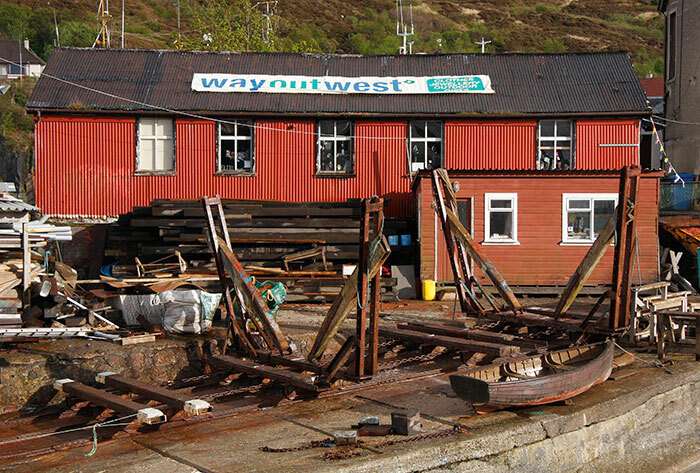 The ABANDONED FISHING BOATS gallery contains images concentrating on the woodworking and structural forms of three derelict vessels at Salen on Mull. This deserted slipway backs on to the working one shown in the earlier images. The rich hematite colour on the corrugated iron building was very strong in the evening sunshine. Perhaps once a workshop, it is now used as an annex to a conventional shop fronting the main shopping street. 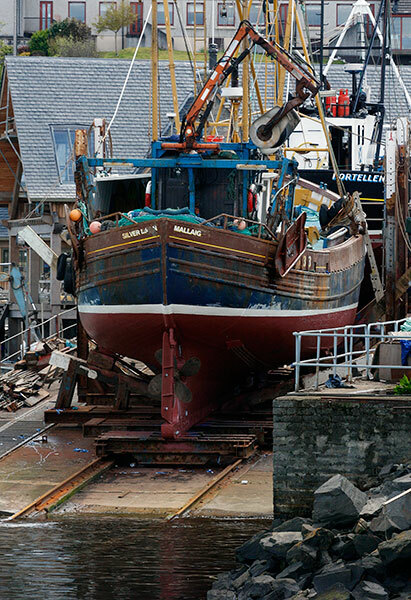 I’ve visited Mallaig from time to time over many years and recall seeing boats hauled up the way for overhaul. 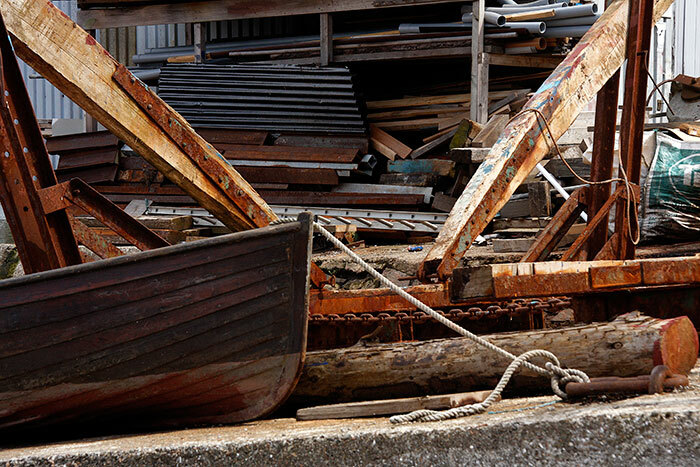 The large boat cradle on the slipway dominates this shipyard still life. A clinker built rowing boat and stored materials add form, colour and texture to the composition. My earliest surviving painting is a fruit still life influenced by Cezanne. The idea of photographing an essentially temporary grouping of objects appeals but I now like to find the composition as a ready-made rather than arrange it myself. There are some examples scattered across the site but STILL LIFE OUTDOORS is the only gallery devoted solely to the format. 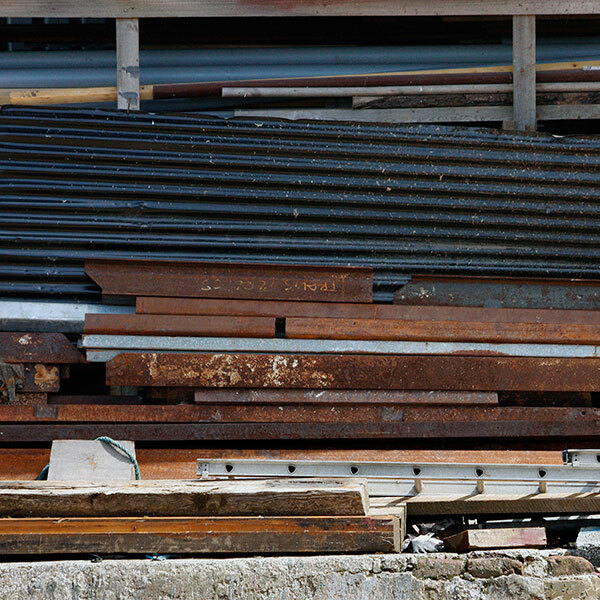 This is a closer view of the materials stacked in the background to the previous image. The organised arrangement of shapes, textures and muted colours in this layering of timber, steel and corrugated iron is akin to rock strata. The CORRUGATED IRON gallery contains images of it as a structural material, both painted and rusty. The unused slipway has open access to it and the low tide harbour floor. It gave this view of the heavy timber piles on the central pier and its inbuilt ladder and steps. The bridge structures of the ferries Loch Nevis and Coruisk stand beyond. On the first evening and after the heavy rains that fell shortly after arriving I walked around the harbour. The low sunlight created a strong contrast between the white paint on deck structures and the coloured hulls. Good daylight levels persisted until well after ten o’clock. 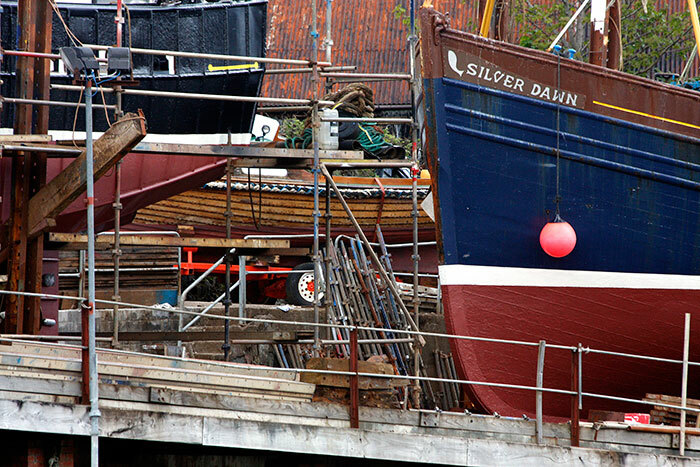 Looking through the upper works on the moored vessels can be visually confusing. I framed this image for the underlying perspective geometry from the closest boat steelwork to the red lifebelt at the furthest point. The contrasting painted letter styles on the Dundee and Kirkaldy registration boards and their placing on the dividing line between light left and dark right appealed. Some order seemed to emerge from the initial confusion. 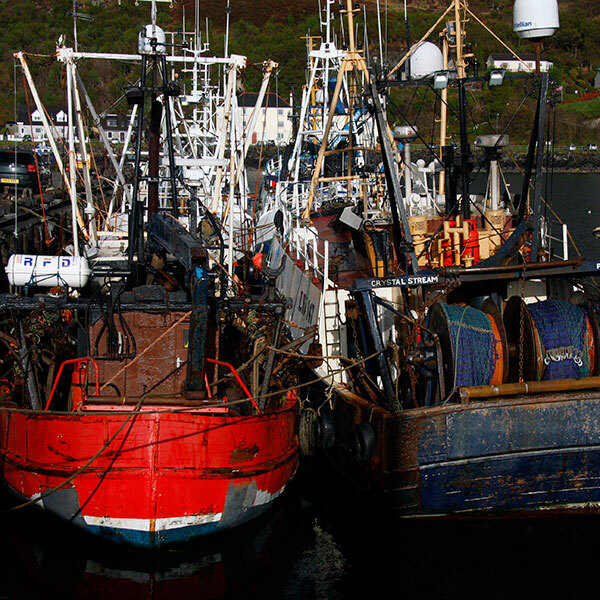 Many of the fishing boat decks and cabin roofs were packed tight with all manner of structures and equipment. It must be difficult to move around and operate it all at the best of times. Breaking waves, fish detritus and irregular boat motion must increase working stress. 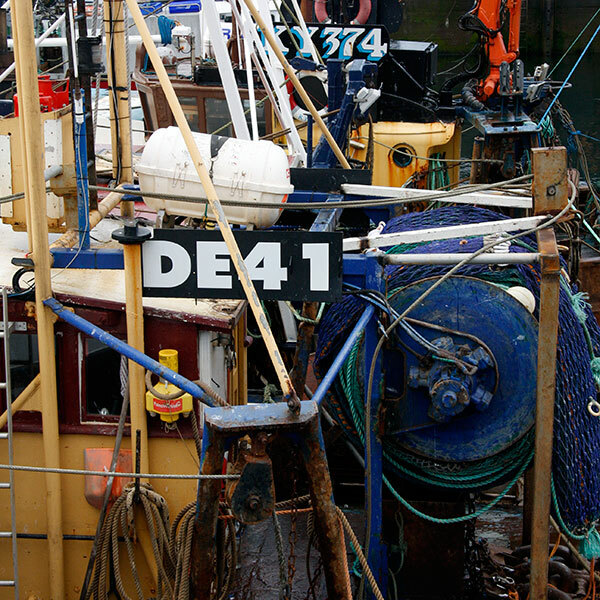 Watching videos of fishing boats working in heavy seas is more than simply impressive. 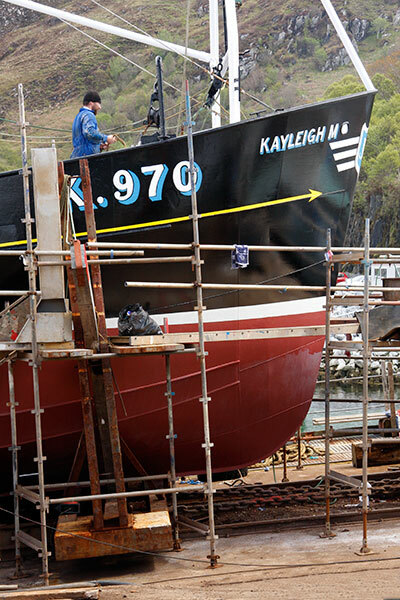 The rusted wear and tear of salt water fishing is much in evidence on the hull and gear of the Alex C, all in great contrast to the pristine paintwork of Kayleigh M on the nearby slipway. 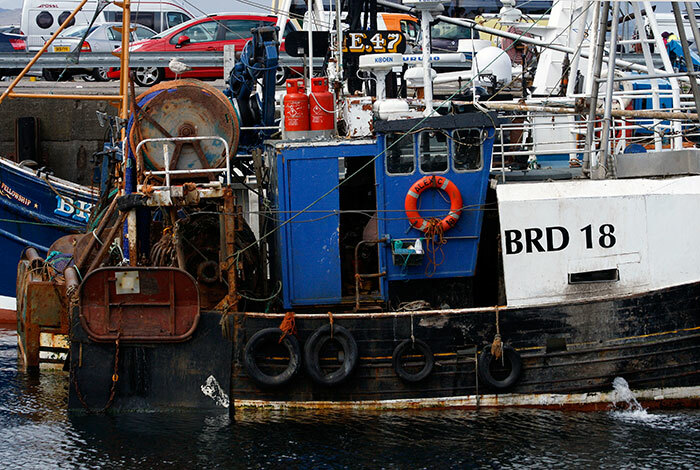 BRD indicates registration in Broadford on the Isle of Skye. 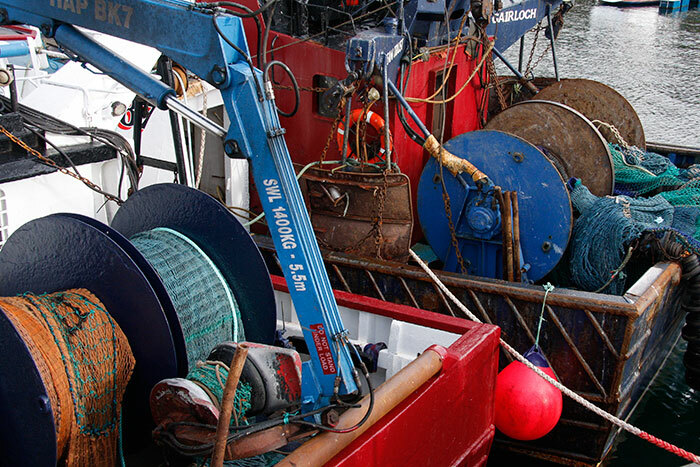 Working conditions seem incredibly cramped, uncomfortable and potentially hazardous in rough seas and poor light. 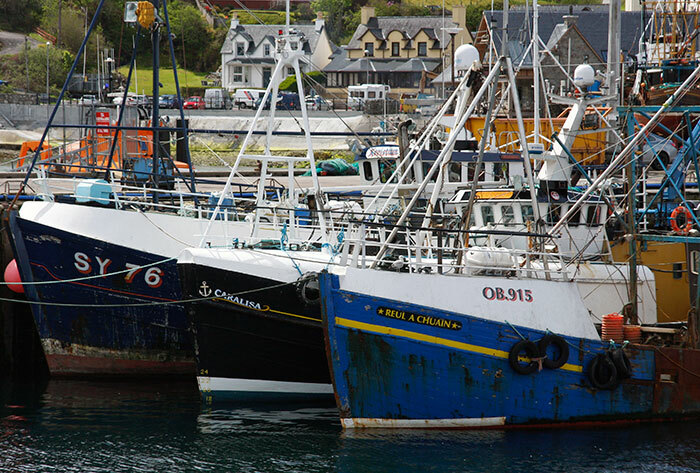 This echelon of boats was viewed from the central quay close to the ferry dock. The multiple dormer windows of the houses beyond are typical of the style across the western coast and islands. White or coloured paint might be applied to a mortar render or the natural stone is just left to weather. Sometimes the individual stones are whitened whilst the pointing between is untouched or painted black to create a pattern of strong contrasts. 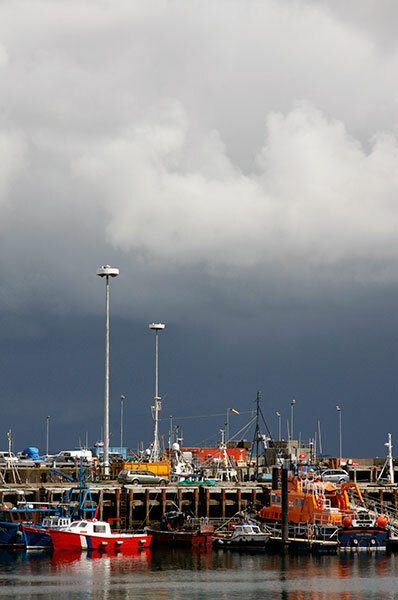 I was in Mallaig for just twenty four hours during which I saw constant and often sharp changes to the weather. These ranged from the torrential rain as I walked away from the station on arrival to clear skies the next day. For me, this mid-morning image summarises the daylight hours with its bright sunshine and billowing white cloud tops against a clear blue sky, all underpinned by much darker tones. I’m looking forward to my next west coast tour by train, bus, ferry and feet.